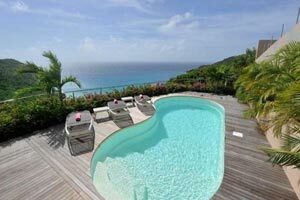 Villa UJV 202 is located in Gouverneur's hillside offering a wonderful view over Gouverneur Bay. This villa has three bedrooms, three bathrooms and a pool. The villa is on two levels under the same roof. On the main floor, the air-conditioned living/dining room opens onto the terrace, facing the view and leading to the pool area on the right side of the villa. The modern, well-equipped kitchen is at the back of the living room. Next door, the air-conditioned master bedroom with ensuite bathroom also opens onto the terrace with view. On the second floor, two equal, air-conditioned bedrooms with ensuite bathrooms open onto a terrace and offer a splendid view over the ocean. This floor also offers an independent entrance from the main level. Villa UJV 202 has a lovely kidney-shaped pool nestled on the right side of the villa in tropical vegetation. It offers space to sunbathe on lounge chairs while admiring the view. This villa is ideally located, a few minutes from Gouverneur beach.